A Halloween horror show as Leyton Orient succumbed to their second home defeat off the season. Josh Windass slotted home his eighth of the season for Accrington who moved to fourth after their win in the Capital, continuing to impress with the free flowing football. Ian Hendon slammed his players post match, speaking to leytonorient.com he described the performance as “unacceptable” but the O’s will need to bounce back next week to avoid a potential FA Cup shock against Staines Town. Orient named an unchanged side ahead of the visit of Stanley looking to build on their 1-0 away win at Morecambe last weekend. Dean Cox was brought back into the squad and was named on the bench as Blair Turgott missed out through illness. Stanley made only 1 change after their first win in three games last week against Dagenham, Dean Winnard came back into the side as Adam Buxton missed out. After picking up 4 points from the last 6 available, Orient started brightly looking to get on the front foot in the early stages. Orient enjoyed the majority of the early possession with Stanley looking to break. It was the away side who had the first real chance of note after nine minutes. Piero Mingoia was given far too much space on the right flank, he drove towards the edge of the box but his cross to the back post was volleyed across goal and wide by Sean McConville. Orient seemed to kick into gear following their close shave, following a corner the ball found Jack Payne on the right flank. He whipped in a delicious curling cross which Connor Essam headed down but only onto the bar. Ollie Palmer’s rebound effort was saved before Jay Simpson inadvertently blocked his second. The home side were knocking on the Stanley door with Orient searching for Ollie Palmer’s head and to get to his knock downs. John Marquis was next to go close after his volley was pushed round the post by Jason Mooney after Palmer had knocked down for the on loan Millwall striker. With Ian Hendon adopting for a 4-3-3 formation, Orient lacked a man in midfield which allowed Stanley to grow into the contest. After weathering the opening 20 minutes, Stanley began to grow in confidence and were urged to go forward by manage John Coleman. The away side began to press Orient higher up the pitch and were forcing mistakes from their hosts. Josh Windass who had netted 7 goals already this term saw a free kick narrowly fly over the bar as Stanley looked more confident. Orient did however go close themselves when Marquis broke down the right hand side, he crossed for Bradley Pritchard who made a dart to the near post but his header was glanced across goal. Billy Kee was proving a real outlet for Stanley with his hold up and link up play very good and it was Kee who set up the opening goal. Jack Payne was caught slightly out of position, Kee dropped into the hole between midfield and attack, he turned on the ball playing in Josh Windass who broke from deep. Adam Chicksen played Windass onside and Stanley’s top scorer made no mistake calmly slotting home. Despite falling behind the pattern of the game continued with Stanley in the ascendancy, playing some lovely football. Their two wingers Piero Mingoia and Sean McConville were afforded far to much room on the flanks, providing real danger for Orient. The home crowd were getting restless with their side getting outplayed by Stanley but they were fully justified of their lead. Dean Cox was left out of Orient’s squad last weekend at Morecambe but Ian Hendon wasted no time in all on chucking him into action after just 30 minutes. John Marquis was hauled off but make no mistake about Hendon could have replaced anyone of the midfielders as no one in a red shirt was playing well. 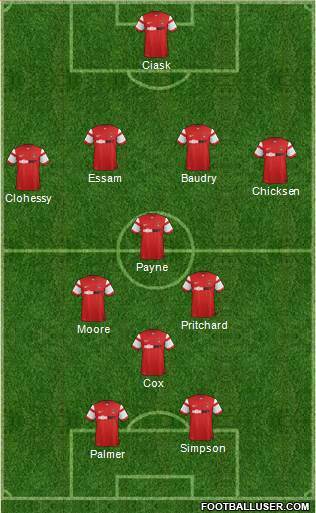 Orient moved from their starting 4-3-3 formation to their more conventional 4-4-2 diamond with Cox returning to his spot at the top behind the two front men. Despite being dominated for the second part of the first half, Orient really should have gone in level. Sammy Moore broke down the right, his cross to the back post was missed by Brad Halliday. Ollie Palmer however did not anticipate this as the ball skated away for a throw in, something you must do a forward. Stanley provided the last chance of the half and could have doubled their advantage, after a period of good possession for the away side, Seamus Conneely had a strike from outside the box which Alex Cisak could only fumble. However disappointingly for the 139 travelling Stanley fans, Sean McConville could only poke the rebound over. Orient continued with the midfield diamond after the break, Ollie Palmer and Jay Simpson linking well on the edge of the box but Palmer was unable to net his first goal since August as he prodded wide. Stanley continued to impress with Billy Kee having the better of both Orient center halves, Sean McConville and Josh Windass were driving beyond Kee and having joy. Stanley’s wingers were the outlet ball all second half as they were awarded time, space and freedom on the ball, something which many are asking Orient to play with. Mingoia broke down the right but his deep cross was headed over by McConville at the back post. Billy Kee went close to a deserved goal but Alex Cisak had to tip around the post after Windass tried to return the favor. Sean McConville also saw an effort curl narrowly wide as Orient struggled to breakdown a resolute Stanley. Hendon threw on Lloyd James after an hour as Orient moved to their third formation of the day but James seemed to have been on the same planet as the rest of his team mates. Orient looked adrift of ideas in attacking areas as Stanley keeper Jason Mooney remained untroubled and without making a save. Dean Cox drove wide and Ollie Palmer headed over but Stanley were by far the better side on the day and fully deserved their three points. Well, what happened there then. Terrible defending, not learning your lessons and being poor in attacking areas. Hendon slammed his players for not listening to instructions, Josh Windass is known for his deep runs from midfield, running off Billy Kee’s flicks forward, something which Ian Hendon pointed out to his players. However, Orient’s defence went AWOL once more, Jack Payne was caught out of position, Kee dropped deep and played in Windass, simple stuff. 2 wins from the start of September is very poor, however it has been nothing more than “work in progress” since the calamity of last year. Orient’s squad is not big enough, everybody knows that, with Blair Turgott missing through injury, there was no different way of playing than a narrow midfield with Bradley Pritchard on the wing. All Orient fans know, you can’t play him there but when you have no other option, what do you do? Stanley showed exactly the way to play away from home, absorb the pressure early on, on another day they could have been behind. But there was only one winner after the 20th minute, it is amazing what threat you can have with pace in your team and runners from deep isn’t it. As bad as Orient did play, credit must go to Stanley who have one of the lowest budgets in the league who are riding high in 4th. Billy Kee and Josh Windass ran Orient ragged in attacking areas and could have scored more on the day. Overreactions always happen after a defeat, it is expected, you have the right to express your opinion if you go to a game. From last weekend’s trip to Morecambe, the defensive facilities were highlighted but not punished, there is a lot of work to be done on the training ground this week. 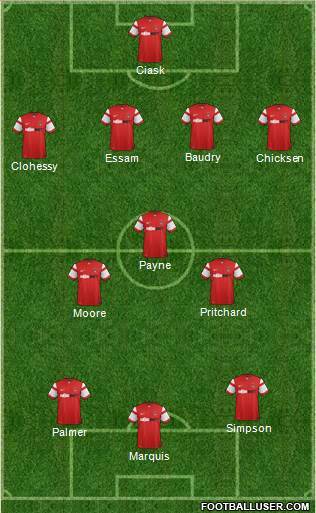 Competition for places is needed in defence with neither Baudry or Essam playing well, is Baudry captain material? Well that is up to Ian Hendon but went the team is losing is Baudry the right man to galvanize the side? For those people critisicing Fraser Shaw in the early weeks of the season for not getting forward and his defending not great on occasions have to look at Adam Chicksen. Is Chicken better than Shaw? On yesterday’s evidence no. Food for thought for Ian Hendon but with a potential upset in the offering with Staines next weekend and tough trips to Plymouth and Hartlepool, it could be a decisive part of the season in the coming weeks. Will their be a reaction next weekend, hopefully their will but the true test will be in the next league match away to Hartlepool on Sky. I will be there but question is will Orient turn up…..